I will admit, I like nice places - very much. When in Barcelona, I loved the fact that I was working in an office that seemed more of a museum than an office, the Gran Teatre Liceu (the opera house on las Ramblas), and the Barcelona City Hall. I like getting dressed up and going to these places. Antiquity does not bother me at all – nor does being around very fine things. In fact, I like to think that I thrive in these settings. At the same time, I am very adaptable. I am currently living in the grungiest/trendiest part of Berlin – Kreuzberg. To be more specific, I am living between Görlitzer Park and the so-called Kreu-kölln area. What does this mean? Graffiti is everywhere. No restaurant/café/building looks “refined” by my U.S. standards – in fact, dogs are welcome visitors at all of these establishments (and Germans like big dogs.) It doesn’t matter if I go to bed at midnight or at 3am – the streets will be crowded with activity and I will have to sleep in spite of the goings-on down below. In the afternoons, if I have free time, I go out to hang my feet over the side of the canal – fighting for a few feet of space among the grass and weeds along with all of the other Germans. And yes, I love it here. Last weekend, I went down to Wannsee – an area that was developed by Wilhelm Conrad. (A relative? I am not sure, although probably not.) This area is known for being particularly posh. Large villas surround the lakeside, sailboats sail out on the lake, children and adults are impeccably dressed sitting out eating ice cream on carefully manicured lawns of parks. This was the second time I had been to Wannsee. The first time, I had been invited by an older Jewish couple to join them for biking and grilling. 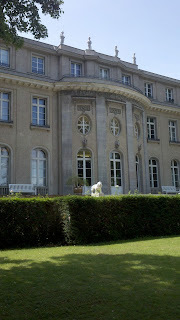 Naturally, we entered into the Max Liebermann Villa, but skipped by the Haus of the Wannsee Konferenz. They told me that it was worth seeing – but it was very emotionally draining. Hence, I had scheduled a trip to Wannsee just to see it later and on my own. 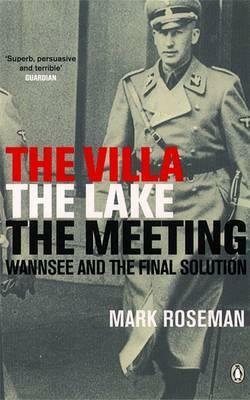 I had even bought and read Mark Roseman’s The Villa, The Lake, The Meeting: Wannsee and the Final Solution in preparation for my museum visit. 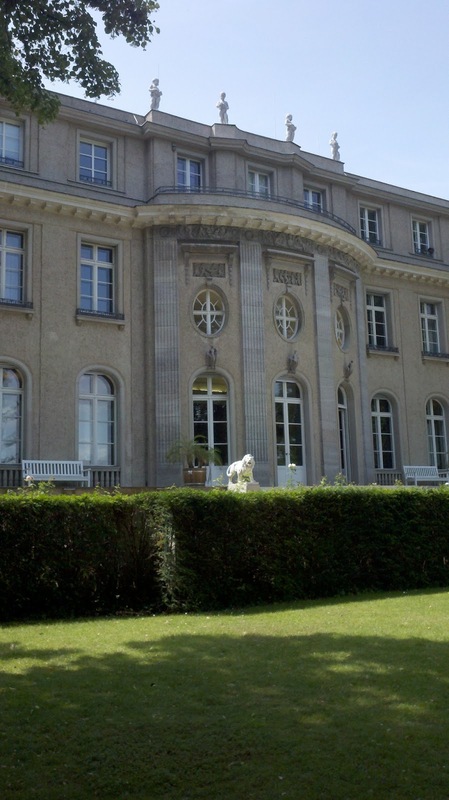 What exactly was the Wannsee Conference? It was a meeting among top Nazi officials that took place on January 20th, 1942 at a beautiful Villa on the Wannsee Lake. Interestingly, before that time, “Wannsee was then associated with cosmopolitanism and a good measure of tolerance. Christians and acculturated or converted Germans Jews lived reasonably comfortably side by side. Their afterlife was similarly harmonious, since both faiths were buried in the same cemetery, the Neue Friedhof, whose walls bear both a cross and a star of David.” (page 64) This conference has gained synonymy to our ears with the Final Solution, or the Nazi genocide of the Jews. The author gives a play-by-play account of what occurred at the Wannsee Conference and why it is so important for us to remember this particular example (not only because it is one of the only remaining documentation that allows us to give some sort of guilt and responsibility to certain officials for the Holocaust. It should be noted that there is nothing in writing that still survives by Hitler which orders for genocide to be conducted.) The author notes that “Wannsee itself was not the moment of decision [for the Final Solution.] Nobody at Wannsee, not even Heydrich, was senior enough to decide on such matters.” (pages 106-7) However, it is extremely important because we can use this event to determine when systematic genocide actually started to occur: “The Wannsee Protocol really did capture a decisive transition in Germany policy, a transition from quasi-genocidal deportations to a clear program of murder.” (page 106) Before 1942, the official policy dealing with the Jews was still nominally evacuation and evacuation was not yet synonymous with extermination. After having gone to the House of the Wannsee Conference, I have to admit this book took on a much more personal meeting. Not only does the house have a museum, but it also gives you the opportunity for a great deal of personal introspection. I walked up the grand spiral staircase and looked out of the windows, overlooking the grounds. I walked on the grounds and the gardens, stopping on a bench to overlook the Wannsee – looking at sailboats and feeling the sun. The idea that this was a place that genocide was discussed and planned was almost unbelievable. Equally unbelievable – and equally disconcerting – was the idea that something as ugly as genocide could come out of a place so beautiful with people with so much promise. According to the book, “two thirds had a university degree, and over half bore the tile of doctor, mainly in law. At the same time, they were strikingly young. Almost half were under forty, only two fifty or over.” ( page 67) The men who took part in the Wannsee Conference had money, power and education – all characteristics which our society teaches us leads to success – and yet they created something as barbaric as genocide.